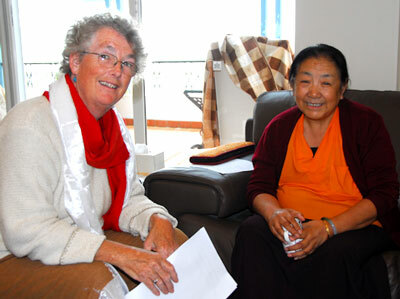 Jacqui's interview with HE Jetsun Kushok Chimey Luding, Sydney May 2009. This is an interview between myself and Her Eminence Jetsun Kushok Chimey Luding. We spoke together when we were both in Sydney for the precious Lam Dre teaching being taught by her brother, H.H. Sakya Trizin. Her Eminence gave a number of empowerments during the 5 weeks of the Lam Dre teachings, including the Vajra Yogini empowerment. This was particularly significant as she regarded by many to be one of the most highly realised female teachers in Tibetan Buddhism today and is seen as a manifestation of Vajra Yogini. In 1959, Jetsun Kushok left Tibet in exile, in order to find safety living in India. In 1971 she moved with her family to Vancouver, Canada. Never ceasing her meditation practice, after an initial period struggling to care for her children and make a living as a knitwear designer in a new country, she was in the early 1980s persuaded by her brother, the Sakya Trizin, to start teaching meditation and Buddhadharma in Vancouver. She now teaches all over the world. In this interview Her Eminence talks about her experience as a mother bringing up four sons in Vancouver and expresses some of her concerns about the suffering children experience when their parents use drugs or drink alcohol to excess. She reports being most comfortable helping families live in peace and expresses concern about the false expectations many people in the West get from watching a lot of TV.